Join us to make our Pattern of the Month! This month we will be handing out a free pattern during the Shop Hop days, which you can sit and work on in the store, or take home and make, or come in for an Open Beading Day for help getting started! The only cost is the materials, which vary depending on the colors you choose. 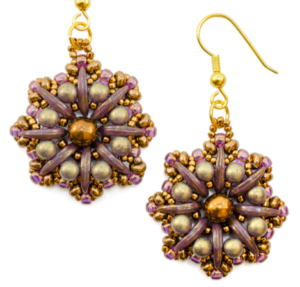 This month’s project is Octavia Earrings by Ivona Suchmannova.